Dolls with ATTITUDE: Whoop whoop! Do you know those annoying birthday cards that play "Happy Birthday"? SFX magazine has issued one as an extra for their cover article on Doctor Who with the TARDIS whoop whoop sound!!! It has a photosensitive cell that switches on the sound as light shines on it and it's powered by two watch batteries. I guess when I'm adding the lights, I'm also adding the sound after all! I'll present it another time, but until then, feel free to vote for it at BBC America's Where's the TARDIS. Conhecem aqueles postais irritantes de aniversário que tocam o "Parabéns a Você"? A revista SFX adicionou um como extra por causa do artigo de capa acerca de Doctor Who com o som whoop whoop da TARDIS!!! Tem uma célula fotosenssível que toca o som sempre que apanha luz e funciona com duas pilhas de relógio. Parece que quando adicionar as luzes, também vou adicionar o som afinal! 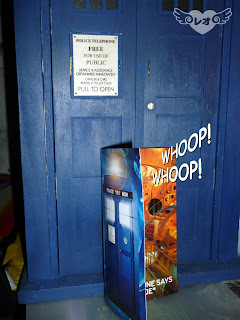 Apresentarei a TARDIS noutra altura, até lá, votem à vontade nela no passatempo Where's the TARDIS da BBC America.